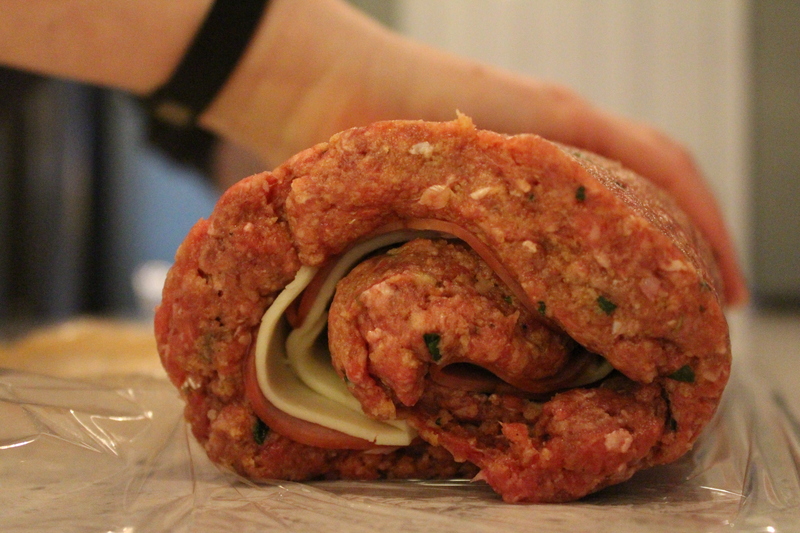 I have had the fortune of growing up with outstanding meatloaves … and one not so much but more about that later. 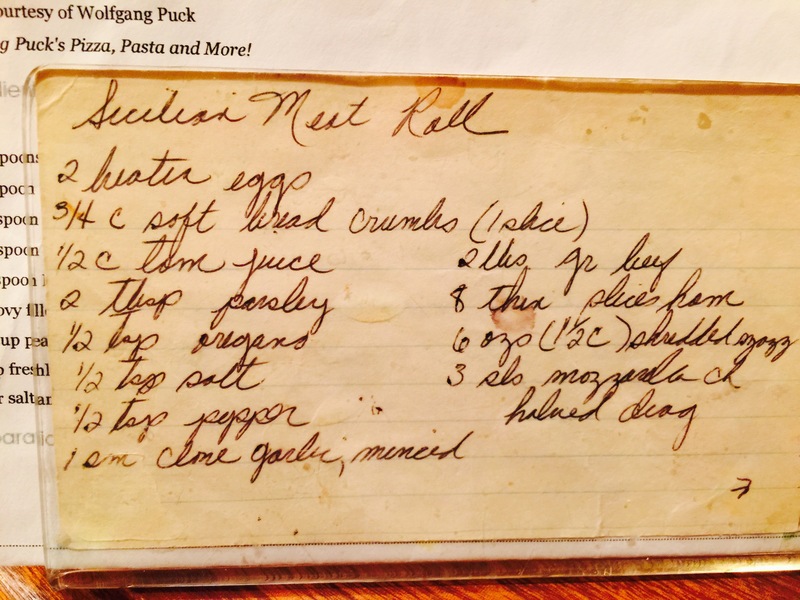 Nonnie always made a lovely basic meatloaf with tomato sauce baked on top. Never dense, always flavorful. And always served with mashed potatoes. Delish! Aunt Myra and Grandmother David would make Syrian meatloaf which was denser and a bit drier but had nice flavor and went terrifically with riz and tomato sauce. The recipe I’m sharing today, my all-time favorite meatloaf, is a decadent slice of meatiness, saltiness, creaminess, and a bit of crunch from where the meat caramelizes on the bottom. Best served just out of the oven with ooey gooey cheesy strings hanging from your fork but rightfully memorable sliced very thinly right out of the fridge on a crusty Italian bread sandwich. Some people add … mayonnaise …. ugh… so I’m putting that out there if it’ll give you a bit of glee. With all of this meatloaf reverie you might wonder where the hate relationship comes from (being as I don’t eat any of the questionable sorts of loaves). Well, let me introduce you to Louise Harry. Long dead now, please know that I think of the woman herself with some fondness. She was a wee lady who was always very kindly to me. But she could not cook. Ohhhhh, but she could not cook. But that didn’t stop her from inviting folks over for dinner. Even unsuspecting little folks who in their thusfar short and delicate lives had never met anything so horrid (oh, wait, there was that liver and onions debacle … but I digress) as Louise Harry’s meatloaf. It was a brown bomb. I do not think salt, pepper or even the grace of God could have fixed that thing. And. We. Had. To. Eat. It. Note to ALL: you force a kid to eat and lo six hundred years later they will still vilify you for that action. Don’t say you weren’t warned. Not too long after that little dining experience, I spent the day with Louise and Grandmother David (they were friends in the same apartment complex). I was probably 10 at the time and they left me on the couch reading while they sat at the table smoking their ciggies and drinking coffee. It was well past dinner time and we hadn’t eaten but Louise’s daughter came over wearing huge sunglasses and they were all sitting at the table having a conversation in hushed somber tones. The daughter took off her sunglasses and I could see she was crying. I remember thinking to myself, yep, she’s just as afraid as I am that we’ll be stuck here for dinner. Louise Harry, ladies and gentlemen, may she rest in eternal peace … with a chef by her side. 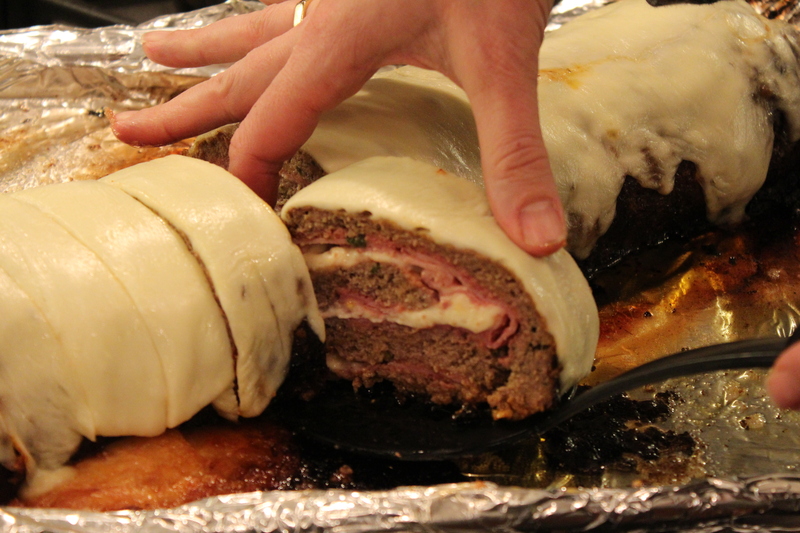 Back to sunshine and lollipop memories … Mom’s recipe cards calls this stuffed meatloaf Sicilian Meat Roll but I thought I’d go with calling it a stuffed meatloaf so folks – including myself – could figure out what the heck they were in for. In fairness, I did ask why it was called Sicilian Meat Roll and her answer was, “well, that’s what it’s always been called.” So there. On with the cooking …. 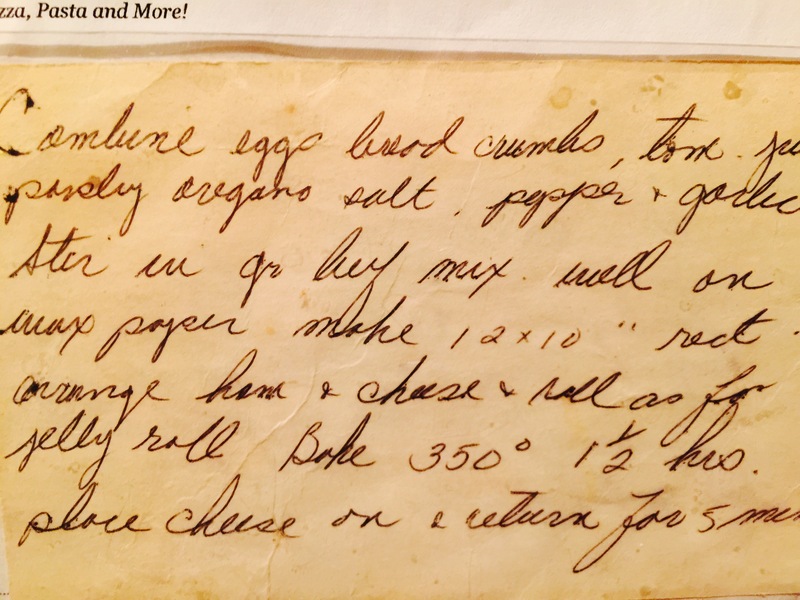 I took these pics of mom’s handwritten recipe when she made this meatloaf for us a few weekends ago. It is almost impossible to make badly (and no, please don’t take that as a challenge). This is a great meal for a crowd, doubles easily (which is what I did for this blog post recipe since we were expecting company but snow changed all that. Can I just tell you, missing the company was disappointing but the leftovers…. not so much. My vacuum sealer was burning up that night. If you read no further, you’ll do just fine. This truly is all there is to it. Just note that fresh herbs are best … Full disclosure: I used dried oregano but fresh parsley. It is a good idea to get everything together before you start. Keeps things cleaner and will also show what you’re missing. I had to call Stephanie who was coming over to take pics to ask to borrow parsley AND oregano. I still don’t have my running grocery list up yet and am missing a bunch of basics that I had forgotten about. Fortunately, she had frozen parsley which thaws and chops just nicely. Make sure you have a bowl large enough to mix in … it’ll get messy otherwise. Whisk your eggs together pretty vigorously so that you don’t have any stringy white bits showing. Next come the breadcrumbs. The recipe calls for fresh but I only have whole wheat bread whose crumbs (to me) are too dense. I use Panko. Whatever you use, do NOT use seasoned breadcrumbs. Finely chop the herbs and toss in the bowl. Add the salt and pepper and don’t be tempted to overdo on the salt (have at it with the pepper!). The ham and cheese add plenty of saltiness. 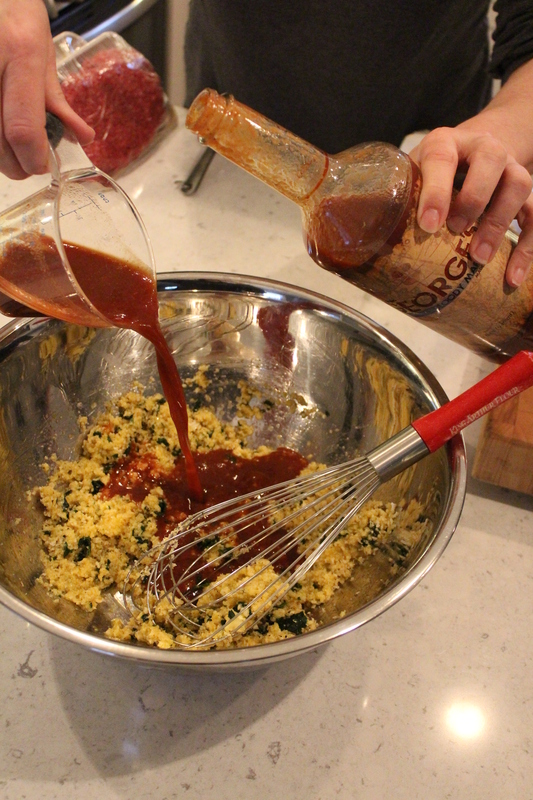 Stir everything together and then … add the magic! The original recipe calls for tomato juice. You could even go crazy with V-8. But for the ultimate tasty “what IS that delicious flavor? !” sort of response to your loaf of meatiness, get thee some George’s Bloody Mary Mix. It’s like the Colonel Sanders recipe of the cocktail world. I do no question the genius in the bottle, I just avail myself of its existence. Oh, makes a freaking faboo Bloody Mary as well. Full disclosure: I sort of know the mad scientist behind the formula. He’s my youngest brother Gregory David. He named the mix after our Dad George. Pretty awesome namesake. Moment to feel a swelling of pride AAAAAAANNNNNDDDDD… done. On with the recipe. Oh, and take off your rings. You are welcome. Now squish and squish and squish some more. Don’t forget the stuff on the bottom… and squish and squish and squish some more. Fun times. Have your meaty mise en place (translations: all yer stuff) ready to go. A foil-lined pan will be your best friend come clean-up time. 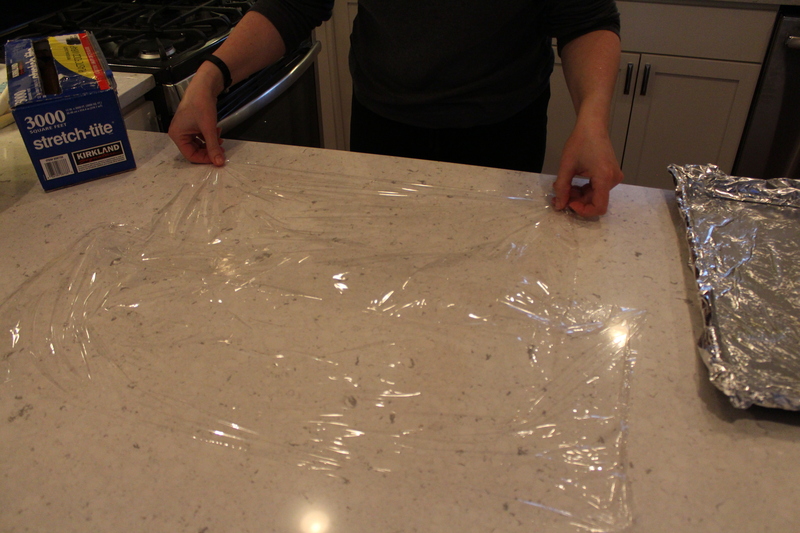 Lay a generously large layer of plastic wrap or waxed paper down. 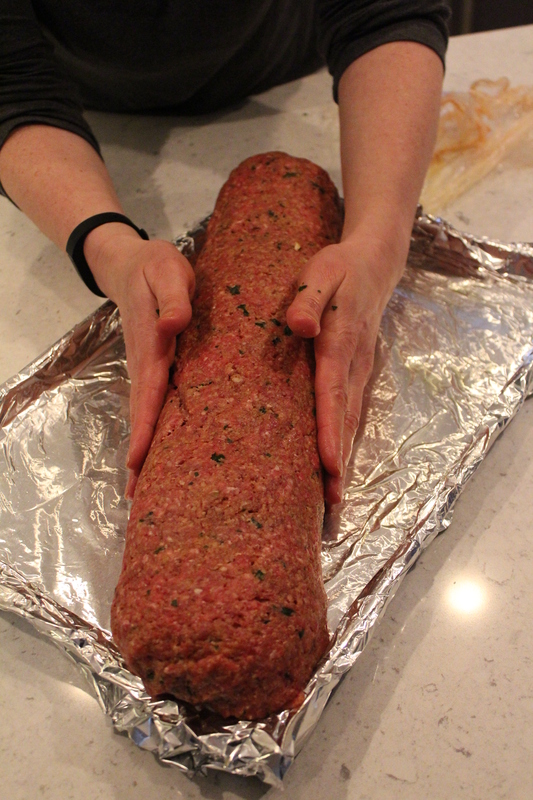 Remember I am making a double match so mine is much bigger than a normal meat loaf though nobody here was complaining. If you lay about 18 x 18 inches you’ll be fine. 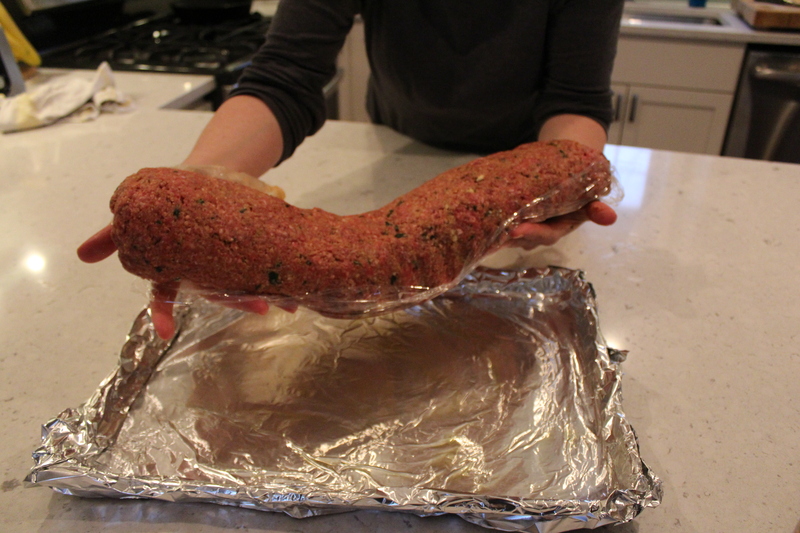 Plop the meatloaf mix into the center of the plastic wrap and pat into an evenly thick rectangle. People who say not to play with your food don’t know what they’re missing. 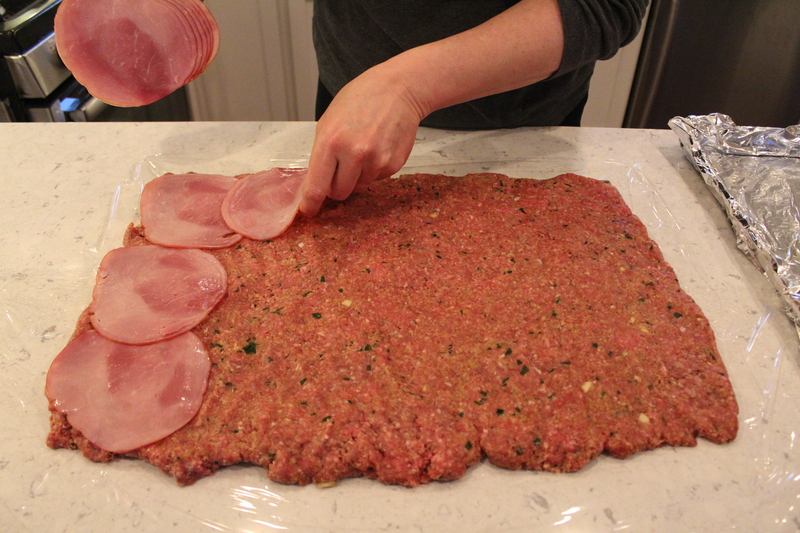 Cover the surface of the meat with a layer of ham. I have overlapped because I had a ton of ham which I’d already sullied with meat fingers so I went a bit overboard. Again, nobody complained. 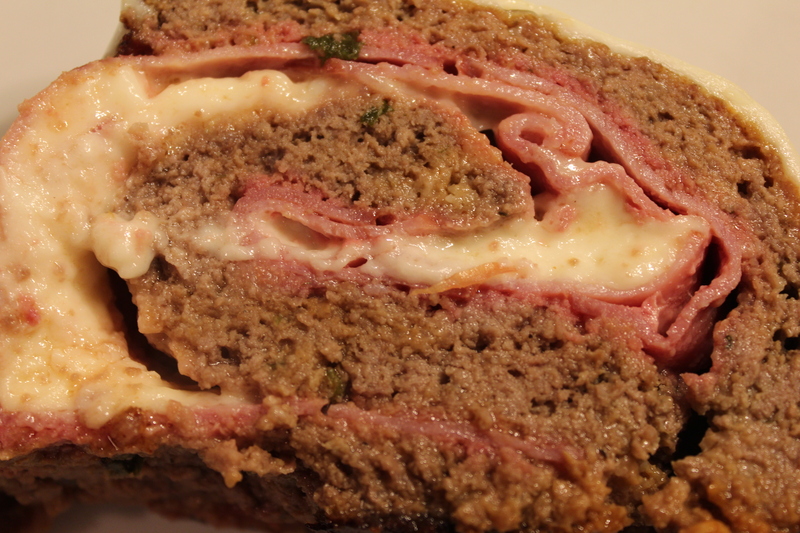 Follow with the layer of mozzarella. You can use the shredded sort (Bunny does) but I am a bit retentive about things so like an even layer. Revel in the glory. I just like Stephanie’s pictures so I’m indulging. Now’s the only slightly tricky part. 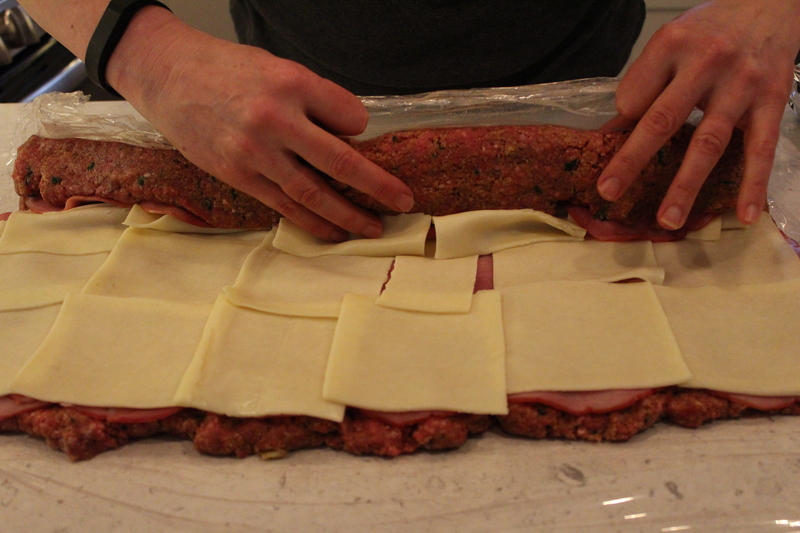 Rolling the meat, make sure you go slowly and keep the roll even from side to side. My caveat on this trickiness is that no matter what, it’s going to taste good so even if it looks like an anaconda with an undigested deer midway, it will taste fabulous. Use your fingers to tuck in wayward bits as you go. You’ll end up with a more or less uniformly rolled log. Use your hands to tuck down and smooth the ends and the seam. You can use the plastic wrap to move it around while you work. Transfer to the baking sheet. This double loaf was a beast to transport but once she landed, I just smoothed the spots that needed smoothing. Oh, and remember to remove the plastic wrap from the bottom! Make sure that you’ve got enough space to catch any oozing cheese and juices. Pop into the oven for an hour and a half and go wait for the sniffs to start wafting. Have a slice of onion-topped focaccia and a glass of wine while you wait? Why, yes, yes I will. Check the internal temperature. Rules these days say 145-155 is safe for ground beef. When it hits 145, I put the final slices of fresh mozzarella on and let it go for 5 minutes. In the time it takes to toss the salad and get everyone to the table, it’s time to eat. See those crunchy, some (Philistines) may say burnt, bits of cheese on the pan? They are cook’s treat. I could almost pass on the meatloaf if I could have the bits. But I don’t have to choose since I’m cook and I get whatever I want. A cut from the center is a good check for doneness if that’s a worry for you. 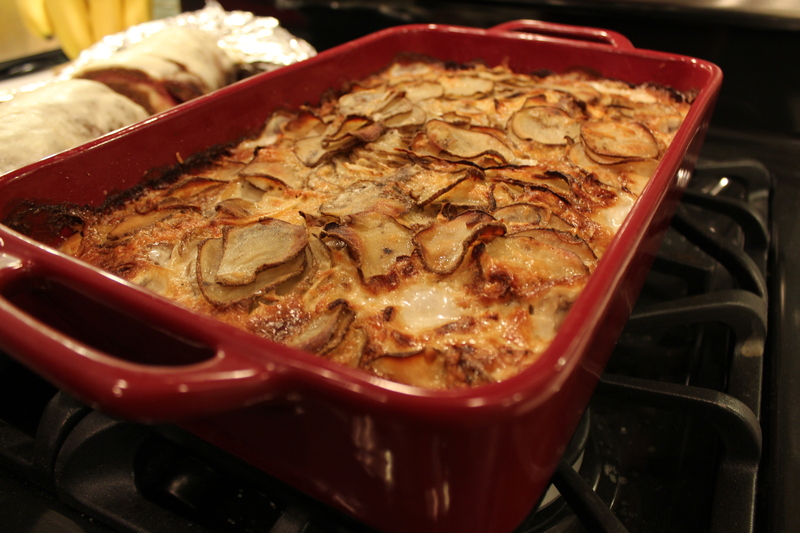 As an easy and delicious side, I baked this gratin dauphinois with the meatloaf. It’s layers of potatoes, onions, cream, a bit of cheese, salt and pepper in a buttered and garlic-rubbed pan. Add a salad and call your beasties to the table. Dinner is served. Another memory on a plate. Enjoy. Combine eggs, bread crumbs, George’s, parsley, oregano, salt, pepper and garlic in a large bowl. 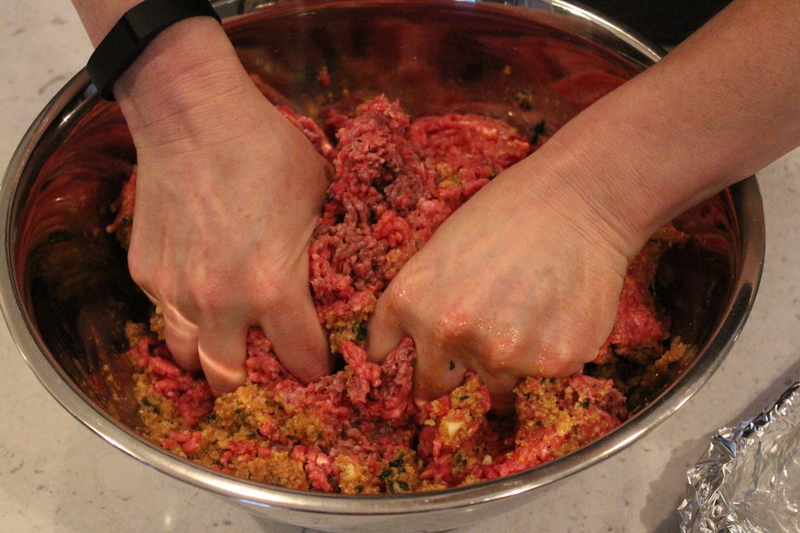 Add the ground beef and, using your hands, mix well. On plastic wrap or waxed paper, pat the mixture into a 12 x 10″ rectangle. 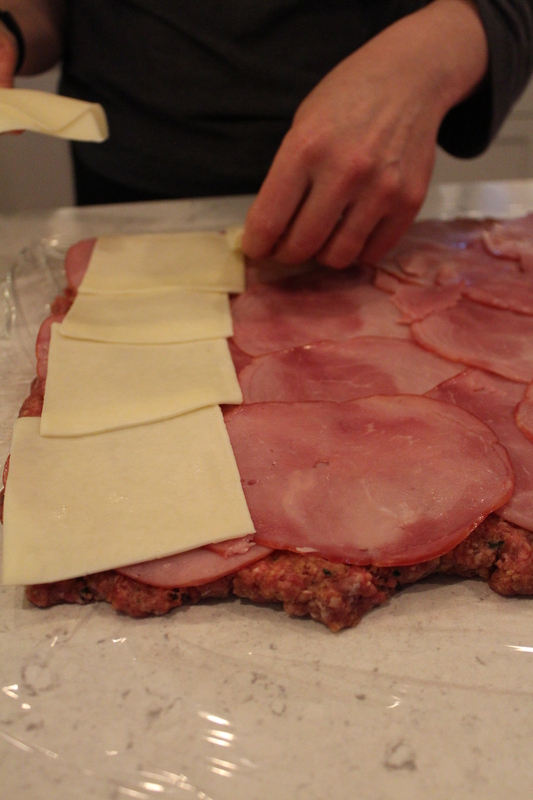 Arrange ham slices evenly over the meat. Do the same with the mozzarella slices (or shreds). Using the plastic wrap to keep the log even, roll as for a jelly roll. 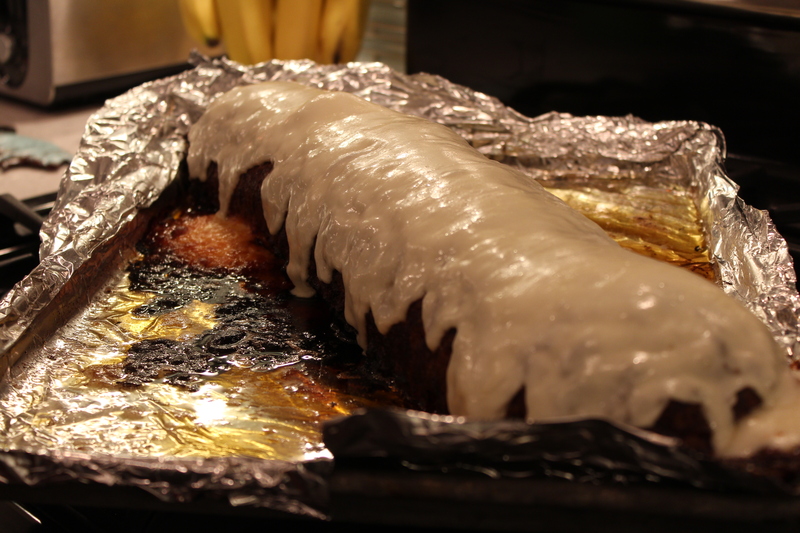 Put onto a foil-lined pan and bake at 350 for 1 1/2 hours. The internal temperature should read 145. Put sliced cheese on top and return to oven for 5 minutes to melt cheese. Doubles easily. Please let me know if you ever triple it. And take pictures! This entry was posted in Italian, Main Dish and tagged Dinner, easy to make, family dinner, feeds a crowd, focaccia, ground beef, ham, Italian, meatloaf, onions, potatoes, salad, sandwiches, sicilian meat roll, special occasion, Sunday dinner, swiss cheese, tomato. Bookmark the permalink. Oh my this looks sooo good. Wish I had Ham and cheese in the house. But I am now making meatloaf for dinner. I make mine gluten free with oats. Did you enjoy your sledding and hot cocoa today? I have a neighbor boy here with Matt today. He called me Momma #1.. I made them chicken nuggets and oatmeal raisin cookies. I’ve used oats before in regular meatloaf but ran them through the food processor first because I don’t like the texture of whole oats. I also added more moisture. Here, you could probably add more George’s. Had a great snowy day; getting ready to start dinner since I’m off today. Man, your cookies and nuggets must be good, Mamma! If you make the meatloaf, tell me what you think adn how the oats turn out.